Have you heard about the beautiful city of Stratford-Upon-Avon in the United Kingdom? If not, then you have no idea what you’re missing! 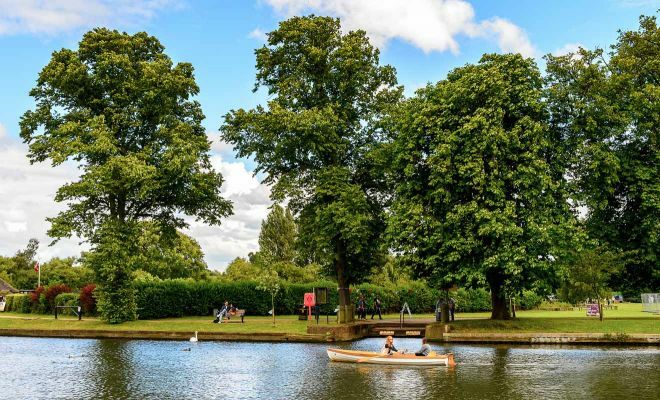 In this article, you can read about the 11 best things to do in Stratford-Upon-Avon! This super cute city has been a magnet for tourists for centuries now! 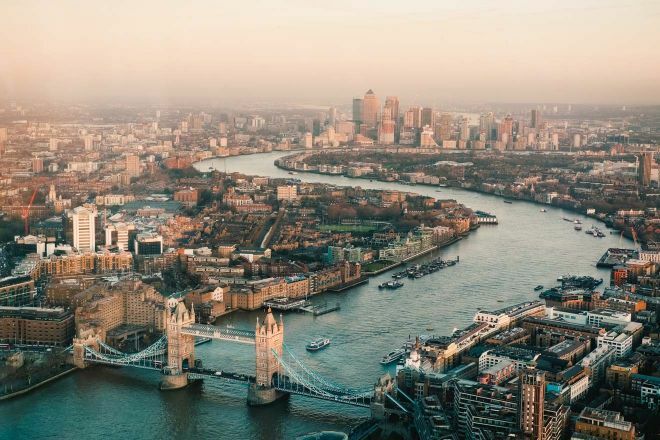 One of the main reasons is because this magical city is the birthplace of Shakespeare himself – one of the greatest English writers and the author of “Romeo and Juliet” and “Hamlet”, among other famous plays and poems! 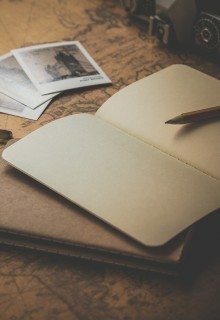 Even if you weren’t aware of the fact that Shakespeare was born there you will soon figure it out because every place – regardless if it is a pub, a shop, a hotel or anything else seems to somehow have a connection with the famous writer – he either ate there, slept there, or he simply was there. Some other reasons why Stratford-Upon-Avon became so developed is because it is an important coal transfer point and a commercial center as well. In case you are planning a trip to the city soon, then read on! 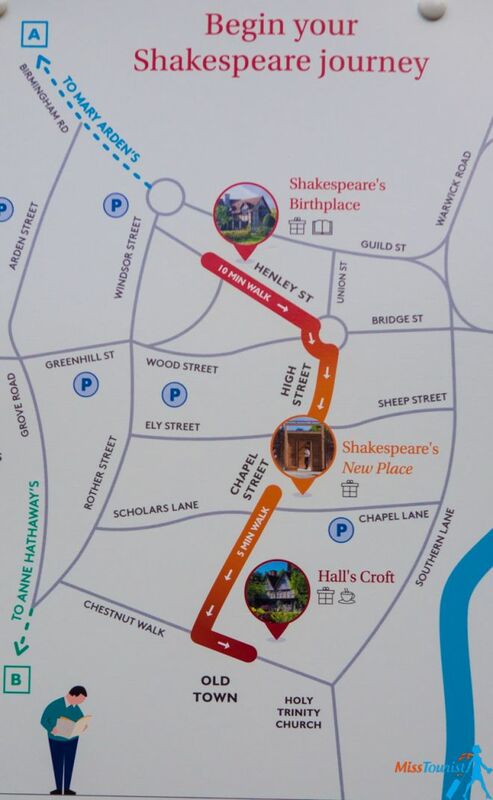 Shakespeare’s Birthplace is a historical place museum and, you guessed it, the place where the famous writer was born. Needless to say, this is also one of the main Stratford-upon-Avon tourist attractions! The house dates from the 16th century and it was restored to look as close to the original place as possible, so it is definitely a must-visit while you are in the city! Of course, you can see this timber-framed house from the outside, but I think it would be very interesting to visit the inside, too. This way, you can find out more about Shakespeare’s family background from the actor-guides there and you will feel like your high-school Literature lessons will literally come to life in an interesting way! Did you know that William Shakespeare was a member of the aristocracy and that his father was a wealthy glove maker? And that the writer himself opened an inn and a pub downstairs that was functional for over 250 years? These and many other good-to-know facts will be told to you by the artists in each room! I really enjoyed my tour there and I definitely recommend it to anyone, regardless if you are a Shakespeare fan or not! WORKING HOURS: From 10 AM to 4 PM during winter time. The tour takes around one hour. 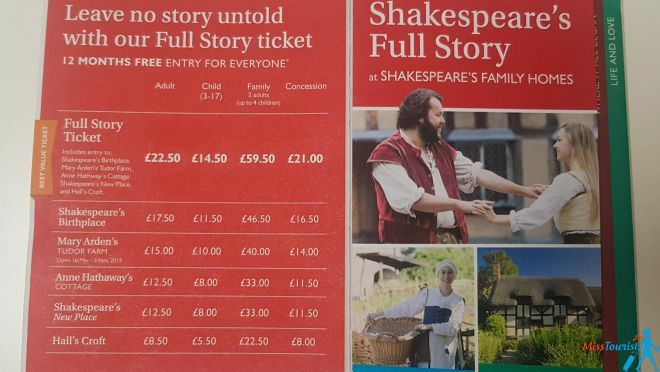 PRICE: The entrance fee is £17.50 but you can buy a combo called “Full Story Ticket” if you want to visit all 5 of the Shakespeare houses for £22.50 here. By using the Full Story Ticket, you will be able to save as much as 60% of the individual prices for these houses. If you buy them individually, the price would be £66, but you can buy it for £22.50 here. TIP: If you don’t want to visit Mary Arden’s Farm, I found an alternative winter bundle for £20.50 here. 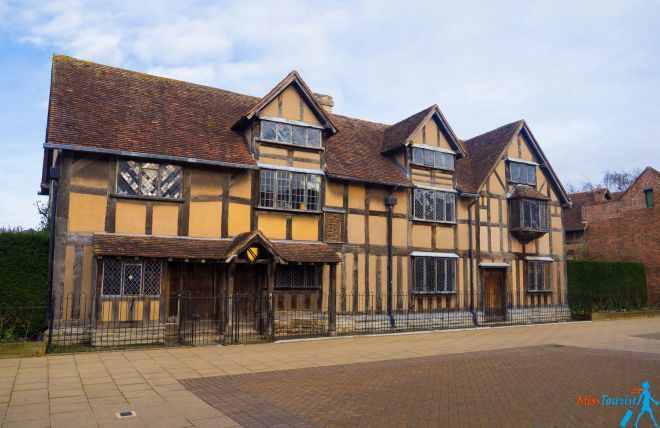 Anne Hathaway is Shakespeare’s wife and this is her childhood home – another one of the main places to visit in Stratford-upon-Avon. You might expect a Romeo and Juliet type-of-love-story between them, but Shakespeare actually got married when he was 19 because Anne claimed to be pregnant. She was 27 years old at the time, 8 years older than him. Some biographers believe that he was forced and tricked, some say it was true, romantic love from the first sight, but we will never know the truth, will we? Anne Hathaway’s Cottage was built in 1463 and she was born there in 1556. Besides being Anne’s childhood home and the place where the writer courted his bride-to-be, this place is worth visiting because it is very pretty, very well-preserved and full of orchards and woodland! All the original furniture was kept intact, so you can have a true understanding of those times. Plus, the cottage has a very nice garden too! WORKING HOURS: from 10 AM to 4 PM during winter time. The tour takes around 2 hours. PRICE: The entrance fee is £12.50. You can buy a bundle to visit all 5 houses for £22.50. Are you interested to see the place where the famous poet was at the height of his creative powers and find out more about his family? Shakespeare’s New Place is the place to go! This is the house where Shakespeare lived for most of his married life (19 years) and where he died too. He moved into the house in 1597 until he died there in 1616. Sadly, the original house was demolished in the 18th century (there is an interesting story behind the reason why it happened which you will learn if you visit), but Shakespeare Birthplace Trust (the company that also owns all 5 of the cottages I mentioned above) rebuilt it and transformed it into an interactive museum! There you can learn all about the life of the world-famous writer! 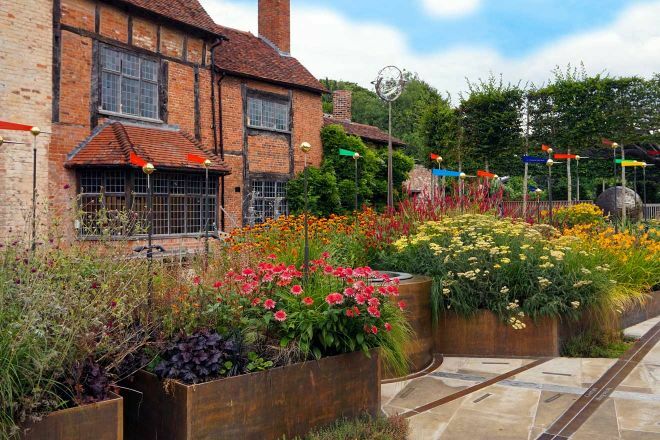 If you want a sneak peek, you can take a video tour of Shakespeare’s New Place here. Now, I told you that almost everything in this city is related to Shakespeare, right? Including this church, which is considered to be one of the most visited Parish Churches in England! 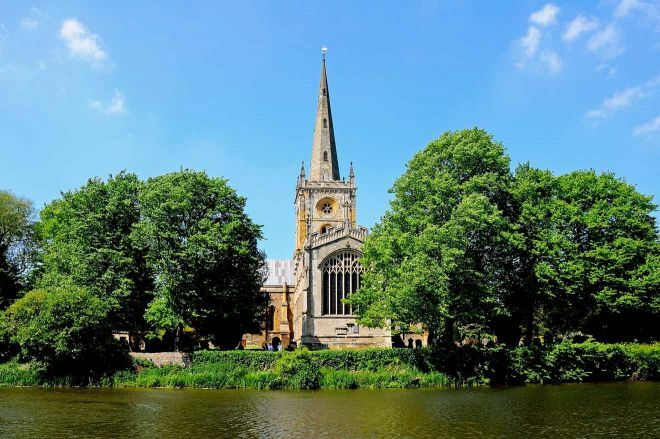 Holy Trinity Church is located right on the banks of Avon River and it is the place where Shakespeare was baptized and buried after his death in 1616. This beautiful, quiet church is around 800 years old, but it keeps being extremely beautiful nowadays too, with its stained glass windows and the high altar. Many people go there just to pay an homage at Shakespeare’s grave but are, in fact, impressed by the entire church, as it is a very nice place to visit nonetheless. 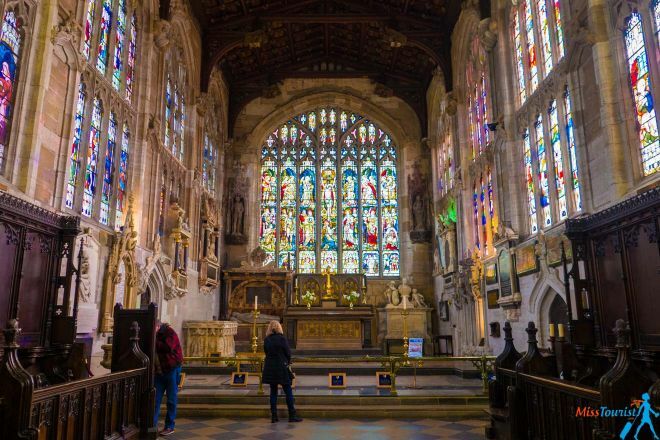 FUN FACT: You would think that Shakespeare’s grave is located in this church because he has done so much for the country and the city of Stratford-Upon-Avon, right? Wrong! This is because he was wealthy and his relatives paid £440 (a significant amount of money for the 16th century) for him to be buried there. WORKING HOURS: Monday to Saturday from 9 AM to 4 PM, Sunday from 12:30 PM to 5 PM. PRICE: £3 is a suggested donation to enter his burial place. The entrance to the church is free. 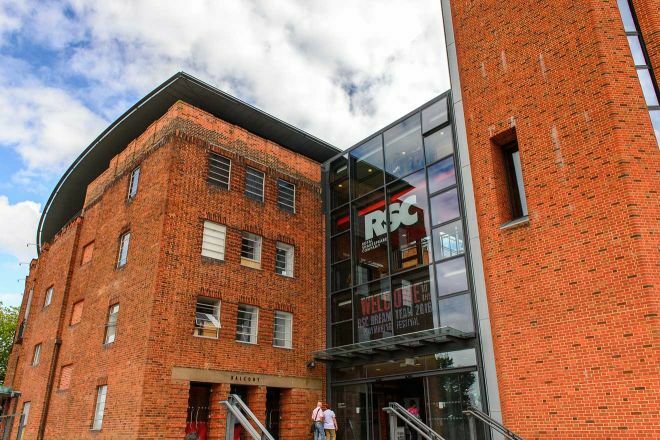 The Royal Shakespeare Company is an amazing theater in the city and, needless to say, going to a proper Shakespeare play is one of the best things to see in Stratford-upon-Avon! And what better place to do it than this one? Of course, Besides his well-known plays, the theater has around 20 new productions every year, some of them written by living artists. In case you do not want to visit it for a play, you can see the theater as part of a guided visit. They offer different types of tours, most of them for £9/person and you can book your favorite one here. 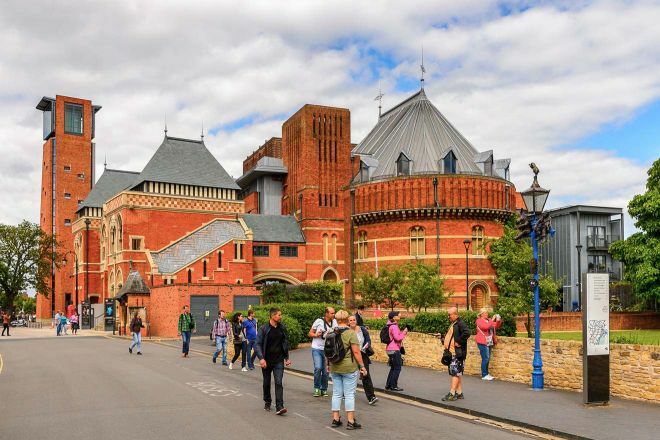 Royal Shakespeare Theatre’s building has a “controversial” story – it was built by a female architect named Elisabeth Scott who wasn’t old enough to vote by that time and, even though many people questioned (and still do) her architecture choices, I quite like it! The building was officially opened on Shakespeare’s birthday on 23rd of April 1932. After that, the theater closed in 2007 for a major upgrade of the inside and it re-opened again in 2010 as it is now. PRO TIP 1: If you want to see a play at the Royal Shakespeare Company, I advise you to try and book your tickets beforehand, as they tend to sell out quickly as the date of the play approaches. PRO TIP 2: Make sure you don’t miss the RSC Rooftop Restaurant if you are visiting on a sunny day – it has an amazing view! Did you know the swan is the heaviest bird in the world? And Stratford-upon-Avon is the perfect place to admire them! During a walk on the riverside of Avon River, you will definitely see many swans on the surface of the water, as they are like a “trademark” of the city. A very popular thing to do during a Stratford-Upon-Avon promenade is to feed the swans and enjoy a peaceful, relaxing evening! Avon Swan Reserve is also located nearby and you can visit it if you want. 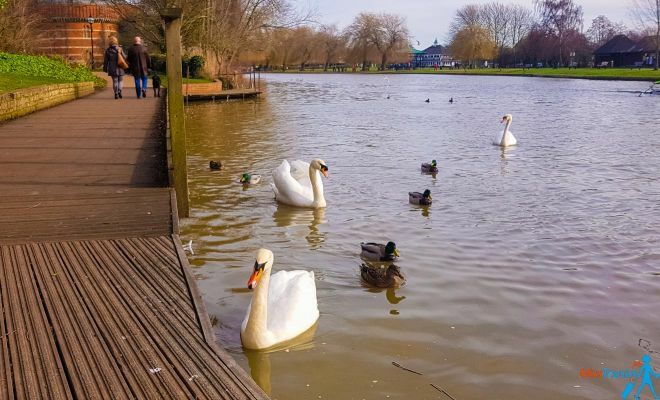 TIP: If you want to feed the famous Avon swans, I recommend giving them brown bread with moderation or, even better, lettuce or spinach, as white bread is not very recommended. If you are interested, you can read more about how to protect the famous swans here (it includes advice from Cyril Bennis, former mayor of the city). 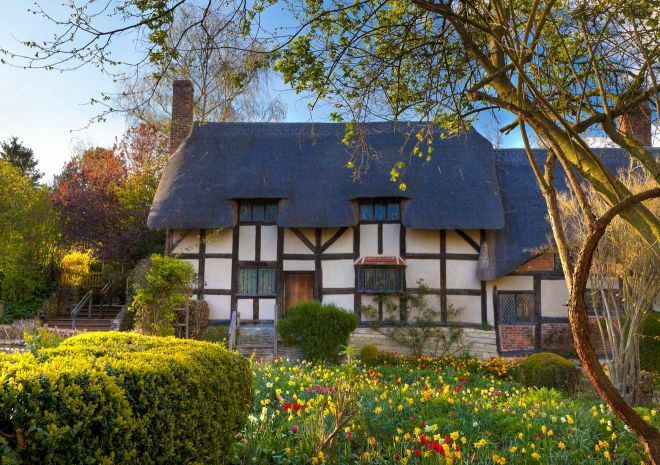 This is another one of the 5 Shakespeare-related houses that you can visit in the city. Mary Arden was William Shakespeare’s mother and Mary Arden’s Farm is the place where she lived and worked. Although the farm is a little bit outside the city, in a small village called Wilmcote (around 3 miles/5km away from Stratford-Upon-Avon), it is worth a visit! They did such a good job in preserving the house and it looks exactly like it did when Shakespeare was a boy! Nowadays there are Tudors who run the farm and take care of animals – by the way, if you are traveling to the city with kids, meeting the animals and letting them feed the goats and herd the geese would be a nice activity for them! 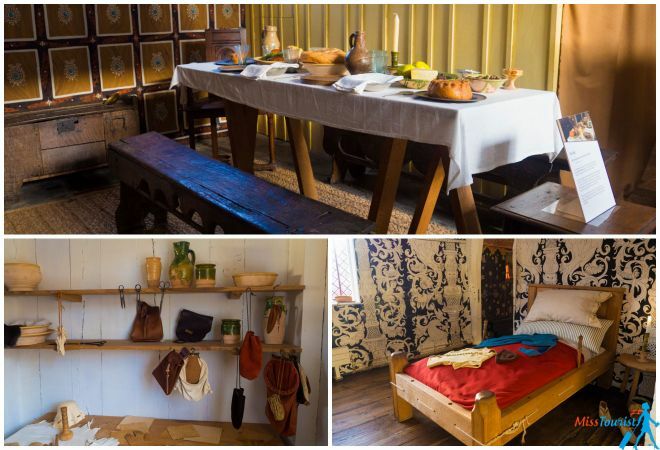 ATTENTION – Mary Arden’s House is closed during the winter and it opens from Easter to the end of October. You can get there by train in 7 minutes and the ticket is £2 one-way. You can check the timetable here. 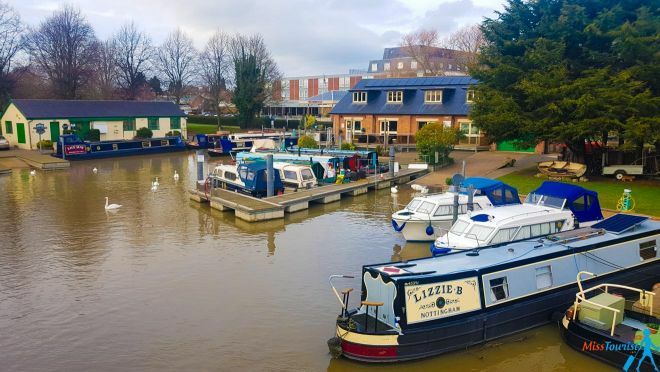 Some other options would be to take a taxi (around £15 one-way) or, if you are feeling like it, you can go for a nice walk from the city center of Stratford to Wilmcote. PRICE: The entrance fee is £15. You can buy a bundle to visit all 5 houses for £22.50. Avon River is a wonderful place to explore and you can take a boat tour there. In my opinion, a normal boat tour is not exactly a must-do while you are in the city, as it takes quite a lot of time (45 minutes to Holy Trinity Church and return) and there is not much audio information given. I took my boat tour with a company called Canal and River Ltd., so I can’t say that it is the same for all the other companies – but if you are keen on doing this, I would, perhaps, try another company. But don’t worry, I have a better recommendation! I think it would be a much more interesting experience to hire a rowing boat. The price is £7/adult/hour and you can buy it right there on the spot or book it online in advance here. If you don’t want to row the boat yourself, there is also the possibility to hire a waterman to do it for you for £14/adult/half hour (minimum 2 people). Another great idea is to go on a river cruise for lunch or dinner. There is a restaurant cruiser called “The Countess Of Evesham” where you can book a 3-course meal and enjoy some delicious food, as well as a stunning view of the river. I recommend booking the lunch instead of dinner in case you want to check out the views! The price for the lunch is £22.5 during the week and £28.5 in the weekends and it takes from 12.30 PM to 2 PM (weekdays) or 12 PM to 3 PM (weekends). You can find more details here. 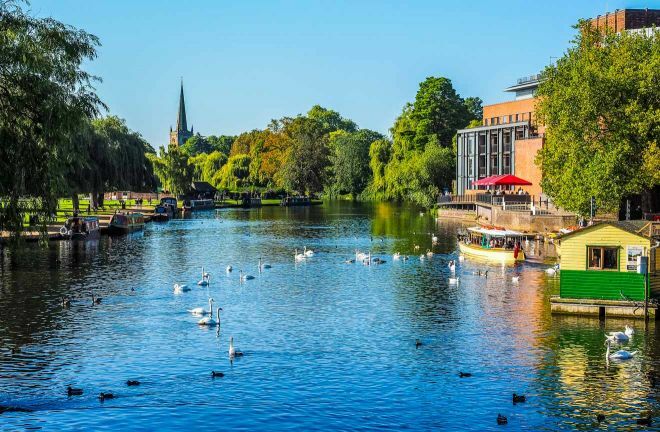 This charming city got its name because it is conveniently located along the banks of River Avon, which means you will find many great options for eating out in Stratford-upon-Avon that offer a view over the river! After a full day of discovering Shakespeare’s birthplace city, you will definitely need to treat yourself to some authentic British dishes on the waterfront. The Countess Of Evesham Restaurant Cruiser – now what could offer you a better view than a restaurant-boat? This is a very nice family-run restaurant cruiser that serves delicious food. RSC Rooftop Restaurant – this is the rooftop restaurant of Royal Shakespeare Theatre with amazing British food and a stunning view! 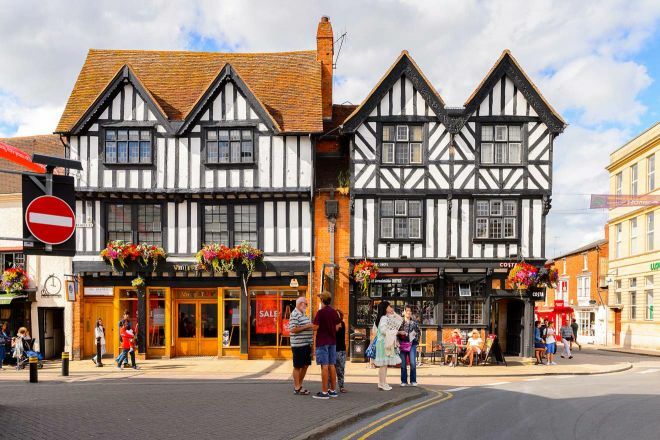 And because we are in Britain, you must check out some good pubs in Stratford-upon-Avon as well, and have some drinks just like a true Brit would do! My recommendations are The One Elm and Pen and Parchment. 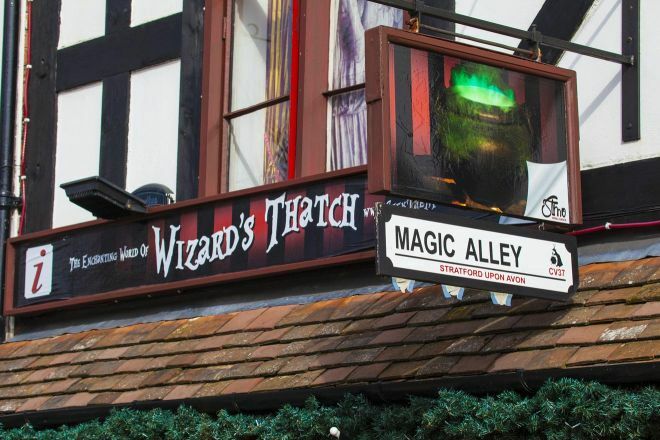 Magic Alley had a place in London before (7 years before the first Harry Potter book was published – this is why they call it “The Original Wizardry World”), but they sadly had to move to Stratford. The place is divided between a quiz room and a shop where you can find cute souvenirs, but the quiz room is the main reason people go there. You could read the book beforehand in case you want to find out what it is all about, but this is not obligatory. You can easily spend an hour there, but I, unfortunately, got hungry and had to leave in about 20 minutes. But the room is truly magical, both in terms of design and atmosphere! 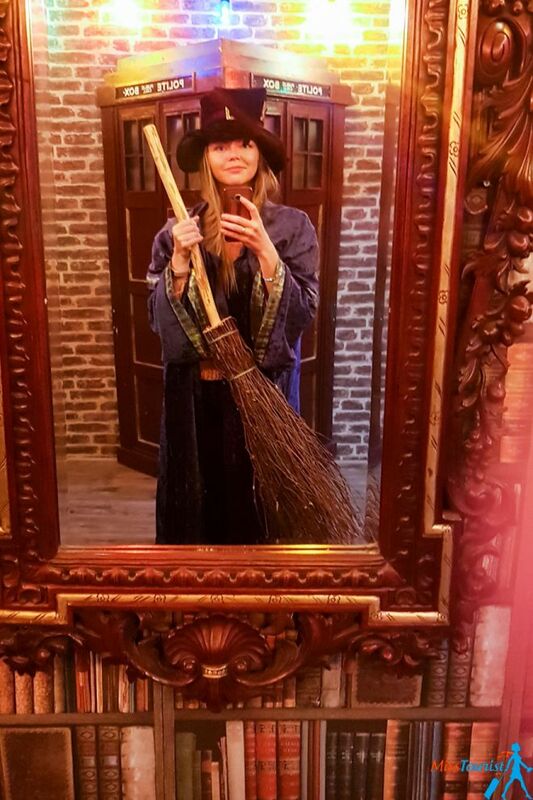 I really enjoyed my experience there nonetheless, and I recommend it to my readers, especially as it is one of those great Stratford-upon-Avon attractions for kids! Plus, they also give you a Certificate of Merit afterward, which could be a very nice piece of memorabilia for the young ones. NOTE: This activity might involve a bit too much reading, as it is not very interactive if you judge by today’s standards. So, if this doesn’t sound like your type of thing, then you might find it a bit boring. But don’t worry, you don’t need to participate in the quiz if you don’t want to! You can just enjoy the rooms and take some pictures. They also have the Magic Alley Café, where you can find “Original Tudor Recipe ButterBeer” (yes, it’s a thing!) and other types of coffee and hot chocolate. Unfortunately, it was closed before I arrived there at 5 PM, so make sure to go earlier in case you want to stop by the café as well! WORKING HOURS: Usually from 10 AM to 5 PM during winter time, but you can check the exact schedule here. PRICE: The entrance to the coffee shop is free, of course. If you would like to participate in the quiz, the fee is £10/person. 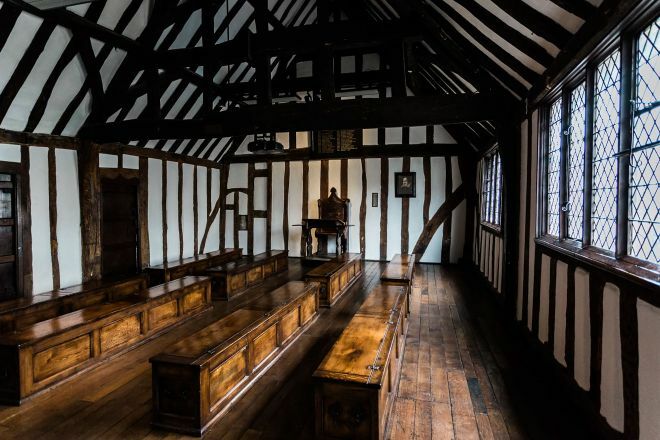 In case you are really interested to find out as much as possible about the interesting life of William Shakespeare, then you might want to visit the Schoolroom & Guildhall – the very place where he studied and was educated to become the renowned playwright he is known as today! 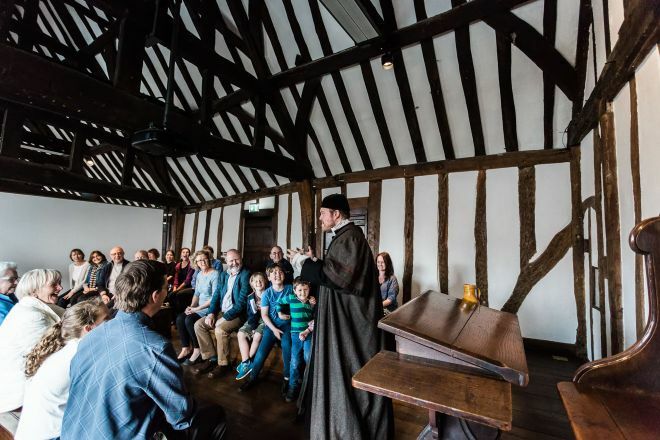 During the tour, you will find out stories about the life of Shakespeare as a young boy and you will be able to sit in the exact same room where he studied. This is also a great thing to do with your children, as they might appreciate the piece of history they will be immersed in, the wall paintings and the Tudor lesson with Master Thomas Jenkins! WORKING HOURS: From 11 AM to 5 PM every day. PRICE: The ticket is £7.20 on their official website if you buy it in advance, but I found a better offer here for £6.80 and the guide is also included. In case you are searching for places to visit near Stratford-upon-Avon, here is a good idea! Warwick Castle is a beautiful medieval castle full of history and myth, built by William the Conqueror in 1068. You can visit the castle and its dungeons, view the daily shows (Bowman shows or trebuchet, for example) or participate in activities such as Knight School, where you can learn tactical defense skills with the castle’s knight. 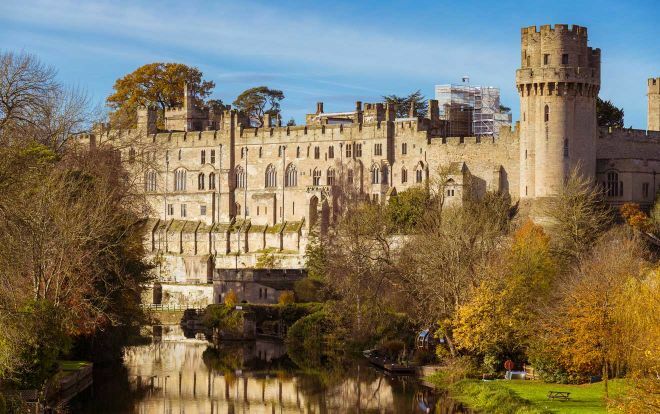 Warwick Castle is about half an hour away by train from Stratford. The train ticket is around £6.10 and the updated timetable can be found here. PRICE: The ticket for the castle alone is £14 and the entrance to the castle and the dungeons is £17. If you want to visit it as a day trip from London, here is a good organized tour altogether with Oxford and Stratford and here is an option with Oxford, Stratford and Cotswolds. 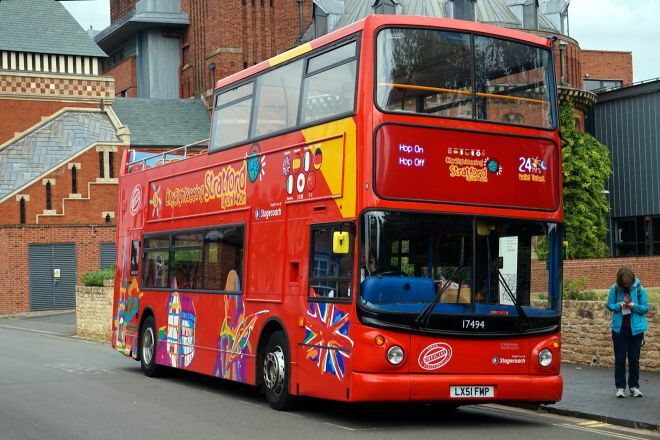 If you are a big fan of the Hop-On/Hop-Off bus tours, then you should know there is one in Stratford-Upon-Avon as well! I personally wouldn’t recommend it because the city is so small, you can get anywhere you want by foot. PRICE: £15 for 24 hours and £23 for 48 hours. 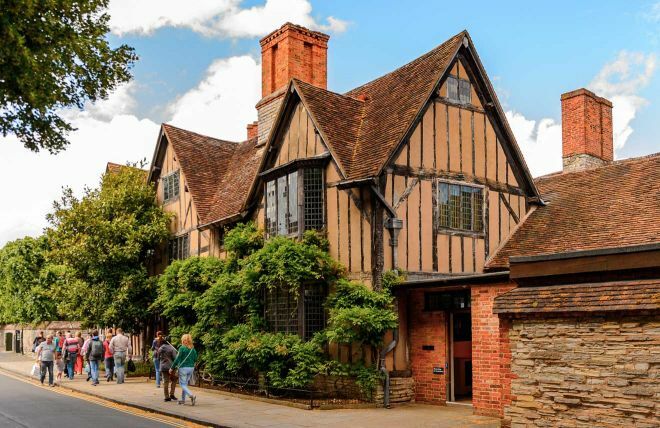 Hall’s Croft is another one of the 5 Shakespeare-related houses that you can visit in Stratford-upon-Avon. I recommend visiting it in case you are interested in finding out more about the life of Shakespeare’s daughter, Susanna, and her husband, the physician John Hall (hence the name of the house). Working hours are from 11 AM to 4 PM. The tour takes around 1 hour. PRICE: The entrance fee is £8.50. You can buy a bundle to visit all 5 houses for £22.50. 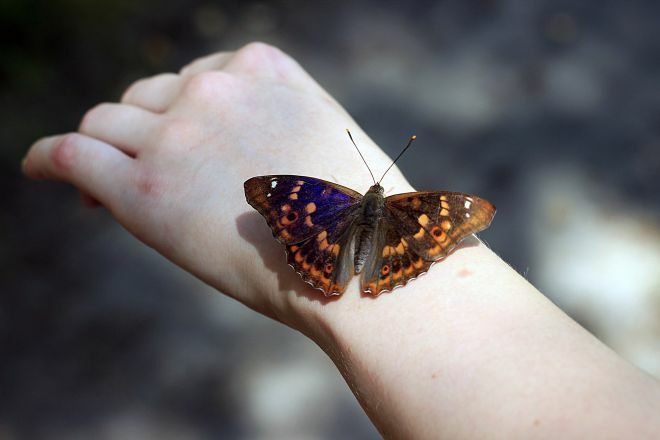 Stratford Butterfly Farm is the largest tropical butterfly exhibition in entire England and, if you are a fan of colorful, beautiful butterflies, this is the perfect place to go! It was right around the corner from my hotel but, unfortunately, I never managed to visit it. Nevertheless, I have heard a lot of good reviews and opinions about it and I think it is a great activity for those traveling to Stratford with kids! 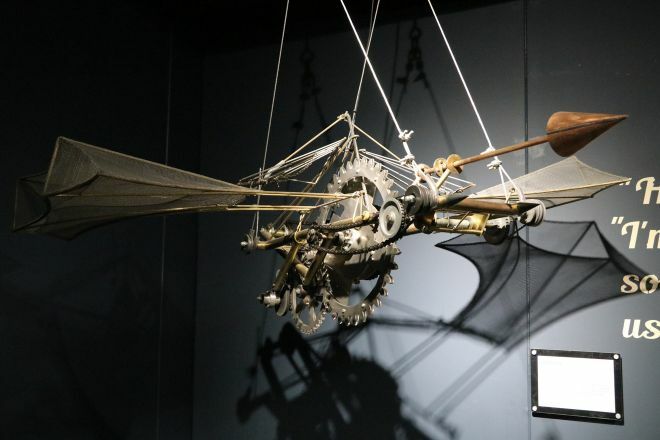 The MAD (Mechanical Art & Design) Museum is one more amazing thing to do if you are traveling in Stratford-upon-Avon together with your kids or if you are interested in mechanical art and interactive exhibits. Robotics, rolling balls, flying mechanical birds, 3D faces and other quirky attractions – this is what you can find there and more! I can definitely recommend it because it is truly interactive and innovative activity and a very good idea for those days when it is cold or rainy. In case you are already in London and you don’t want to spend many days in Stratford because you only have a limited amount of time in England, you can definitely visit it as a day trip! For example, you can visit Stratford-upon-Avon, Oxford and Cotswolds (a beautiful country-style area with golden stones and green hills called “wolds”) as a day trip for London with an organized tour for £48/person, which you can find here. Another option would be to visit Stratford, Warwick Castle and Oxford with this tour for £59/person. If you wish to visit the famous Stonehenge as well, together with Stratford, Bath, and Cotswolds as a 12-hour day trip from London, there is also this possibility here. There are so many things to do in Oxford, I recommend spending at least 2 days there! This is a good option only for those who have veeeerrry limited time and want to see everything in one day. Are you passionate about magical stories and ghosts? Then a Stratford Ghost Walk might be the best idea for you! During the Stratford Ghost Walk you can learn all about the ghosts, witches, and urban stories about murders and disappearances in Stratford! In case this is your kind of thing, this walk promises to be an adventure as each guide is an actor. This immersive award-winning walk is organized every Saturday from 7.30 PM to 9 PM and you can find more details about it here. PRICE: The price is £7/adult and £5/children. There are many pretty hotels in Stratford-upon-Avon that you can choose from! I stayed in Macdonald Swan’s Nest Hotel and I can say that my experience there was pretty nice, so I definitely recommend it! This 17th-century hotel is very cozy and it is located very close to the RSC Theatre. The rooms are spacious and nicely decorated and the location is pretty good as well. The only downside is that it is a bit far away from the train station (about 20 minutes), but otherwise, you can reach any other attraction in town in about 10 minutes, which is a great plus. The only note I have is that if you decide on using room service to order your dinner, try to do it before 9 PM. Even if it says that it is open until 10 PM, sometimes they leave earlier (which was in my case) and it was quite a disappointment to learn that. As I did not feel like going out and the lady at the front desk did not help much, unfortunately, I had to stay hungry. But the breakfast was nice and plentiful! 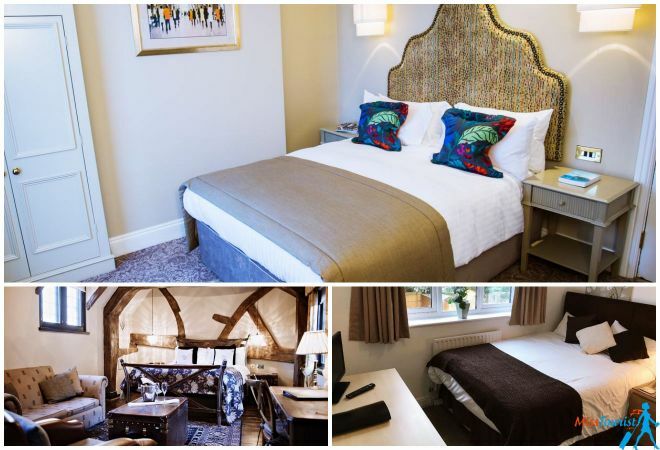 Luxury hotels (£130 and up): Arden House – Eden Hotel Collection is an amazing 5-star hotel and one of the best hotels in Stratford-upon-Avon city centre. 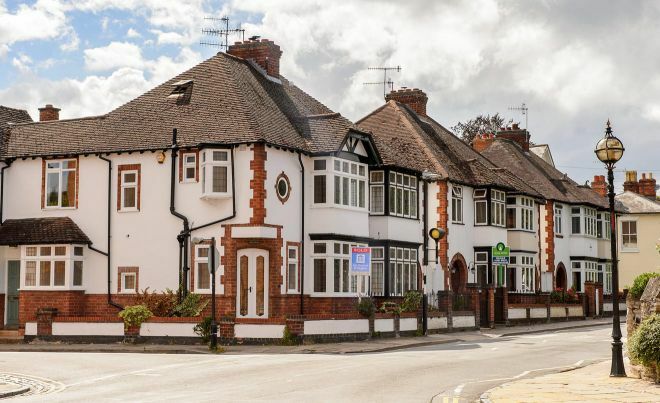 The location is very good as it is close to the Royal Shakespeare Company and Swan Theater and the property also offers free parking and free Wi-Fi. 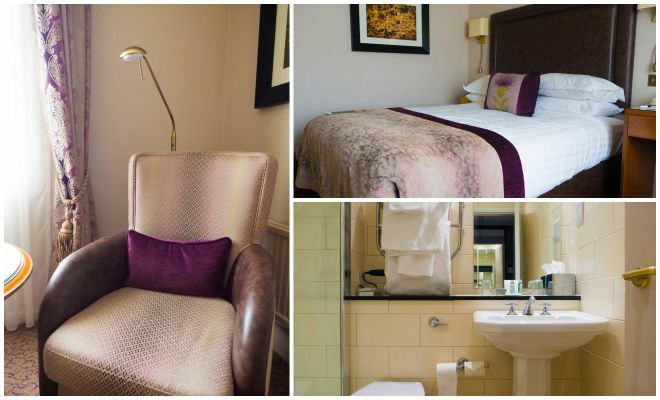 Hotel Du Vin Stratford is a gorgeous 4-star hotel with free Wi-Fi and an on-site restaurant. It is very close to all the main activities in Stratford-upon-Avon and a delicious continental breakfast is served there each morning. 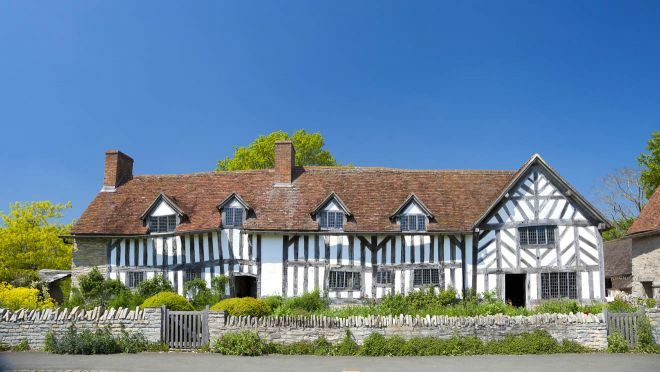 Middle-priced hotels (from £75 to £130): The White Swan Hotel is a superb 4-star inn with a rustic and modern atmosphere at the same time, which I am sure will offer you a very good stay in Stratford-upon-Avon. Their restaurant serves very good British dishes and all the rooms have a very nice décor. Crowne Plaza Stratford-upon-Avon is a great 4-star hotel and one of the top picks for the city. This one is located a bit far from the train station as well (1.6 km), but otherwise you will be close to all the other important attractions. Budget (up to £75): Applegarth Guest House is a very nice guesthouse located right in the heart of the city. It offers a very good value for money, the rooms are rather small but very neat and you will also get free parking and free Wi-Fi. The Clayton Guest House is another great option on my list of cheap hotels in Stratford-upon-Avon, which offers a delicious breakfast each morning! Located less than 1km from RSC and very close to Mary Arden’s Farm, I think it is a very good Stratford-upon-Avon accommodation for those traveling on a rather tight budget. YHA Stratford-Upon-Avon is a very good 4-star hostel with good prices, a restaurant and a cool café. Plus, it offers free parking! For those who are keen on trying some glamping, there is also the option of staying in Hobbit Huts in Stratford-upon-Avon in Riverside Park. The park is open form the 1st of April and until the 3rd of November for 2019 and the price for 4 nights (Monday to Friday) is £75 in low season and £150 in high season. You can find more details and prices here. 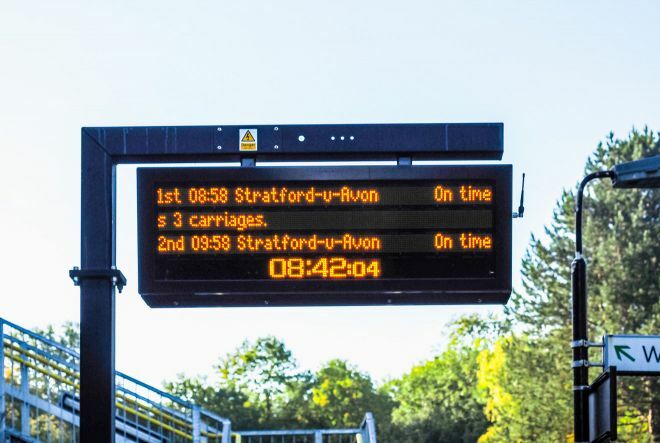 You can get from London to Stratford by train. Travel time is around 2 hours and the ticket varies from £7 to £30, depending on how far in advance you book your trip. You can find the updated timetables and prices here. The cheapest tickets are, as always, outside rush hours. Mine was at 1 PM and it was only £8. You can also take a bus from London Victoria Coach Station to Stratford-upon-Avon. Travel time is around 4 hours and the ticket price is around £10. You can find more details about the timetable and prices here. Renting a car is always a good idea for discovering a certain area, especially in the United Kingdom, where all the roads are good and they will get you through some beautiful, rural landscapes. 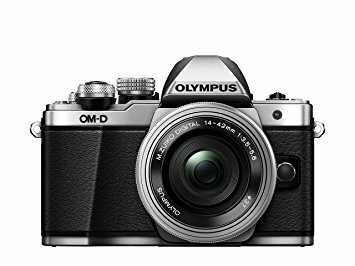 You can check all the offers available from different companies here. There is also the option to book a private airport transfer directly from London Heathrow Airport to Stratford-upon-Avon. The price is £37 and you can arrive at your hotel of choice. It is recommended to pre-book your airport transfer here. 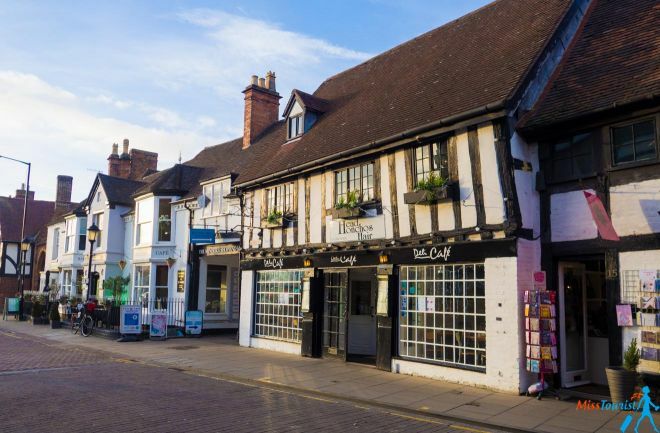 Besides the fact that Stratford-upon-Avon is Shakespeare’s birthplace, this little city has so many other great attractions and activities that are worth visiting! I really enjoyed my time there! In this article we covered the top 11 things to do in the city, as well as some bonus activities if you have some more time and useful information about accommodation and how to get there. 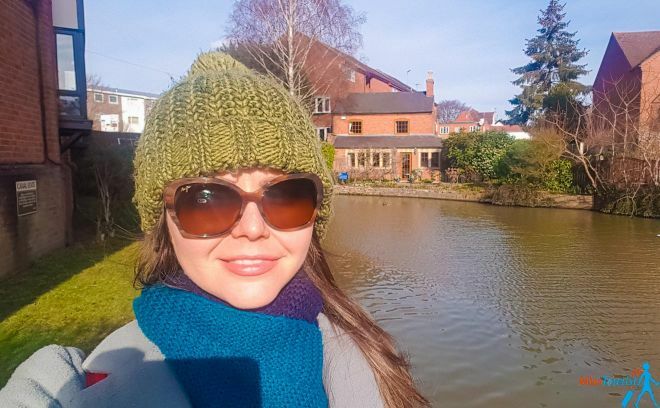 Even though the highlights of Stratford-upon-Avon can be visited as a day trip from London if you are short on time, I definitely recommend spending at least a couple of days in the city, as it has such a charming, beautiful atmosphere, perfect for a quiet holiday! This city is also perfect for people who are traveling to the United Kingdom with kids, as there as countless activities for them as well! Do you want to discover more of Great Britain? In this article you can read more about the best things to do in Oxford as well! I hope this article helped you create the perfect itinerary in Stratford and I wish you a great vacation in this wonderful city! As usual, if you have any other questions, please leave them in the comments below, I am happy to answer! Wow! Your pictures were amazing. So, she was 27 and he was only 19? Gross! But love the small town places-to-stop you shared. I really like to share your all these gorgeous photos which views very fabulous and cool. I also enjoyed your shared all these interesting things during my last journey and came back with smiley faces.